Hi there and welcome back to the third part of the “Kubernetes on bare metal” tutorial,in this part I wanna pay attention to the cluster monitoring & collecting logs, also we’ll run some test application for utilising previously configured cluster components. After all we will implement some stress tests and will check stability of this cluster schema. First and very popular tool that Kubernetes community can provide for getting some web UI and statistical data about your cluster, it’s Kubernetes Dashboard. In fact it still under developing, but even now it can provide some extra data for troubleshooting applications and managing the cluster resources also. It’s a bit controversial theme, is it really need to have any WEB UI for the cluster management, or using a console kubectl tool is quite enough. Well, sometimes it may be useful and complementing each other. Let’s deploy our own Kubernetes Dashboard and see then. Standard deployment will run this dashboard on localhost address only, so you’ll need to use kubectl proxy command to expose it, but it’ll be still available only on your kubectl control machine locally. This is not bad for the security reasons, but I like to have access to it outside cluster in my browser and I ready to take some risks (anyway it’s use ssl with strong token). To use my way, you need to change a bit standard deployment file in service section. We’ll use our load balancer for exposing this dashboard on public address. Great, as you can see our LB added the 192.168.0.240 ip for this service, now you can try open https://192.168.0.240 to see the Kubernetes Dashboard. 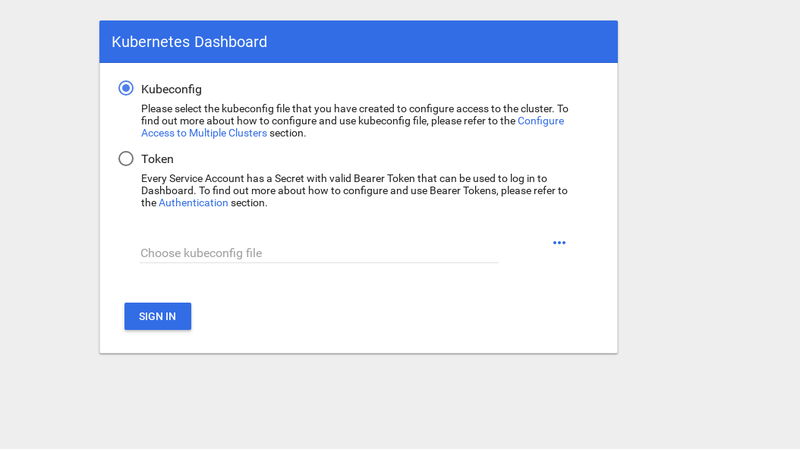 We can use two ways to get access in to it, using theadmin.conf file from our master node, that we previously use for configuring the kubectl or by creating a specific Service Account for it ,with security token. Now copy the token and paste it into Token field on login screen. After you login, you can explore your cluster a bit more, I like this tool. This tool can provide us console based cluster utilisation statistic, but also it’ll add more information about node and pods resources to the Kubernetes Dashboard too. It a bit tricky to install it on bare metal cluster, an I was need to make some investigation about why it wasn’t work from “box” but I have found the decision. # If you are NOT using this as an addon, you should comment out this line. In this description you can find all this options. I have changed the kubelet port to 10250 and disable ssl certificate checking (there was some issue with it). OK, now lets run a command to make sure our heapster deployment running successful. Good, if you got same output it’s mean that all was done right, now lets login back to our dashboard page and check new graphs that now available. From now we can also see the real resources utilisation for the cluster nodes, pods and so on. If this not enough, then you can improve your statistic a bit more and add the InfluxDB+Grafana. This will add ability to draw our own Grafana dashboards then. We’ll use this InfluxDB+Grafana version of installation from the Heapster Git page, but with modification as usual. As we already have previously configured heapster deployment, the only things we need to do, it’s add Grafana and InfluxDB and change the existing heapster deployment then, to make it write metrics to Influx too. Then Grafana, also don’t forget to change the service configuration for enabling MetaLB load balancer on it, to get external IP for Grafana service. # service using a LoadBalancer or a public IP. # or through a public IP. My Grafana was empty after I have logged in, but fortunately we can get all needed dashboards from grafana.com, we need to import the number 3649 and 3646 dashboards. Choose the right data source when you’ll import them. After this, you’ll be able to see Nodes and Pods resources utilisation and you can create own custom dashboards of course. Well, that’s all about monitoring for now, next things we may need, it’s storing logs from our applications and cluster . There’s few ways how we can do it, all of them described in Kubernetes documentation. Based on my own experience I prefer to have an external installations of Elasticsearch & Kibana services and only logging agent will be running on every Kubernetes worker node. This will save our cluster from any overloads, due to the big amount of logs and other problems, also it’ll be possible to get logs even if our cluster will fully degrade. Most popular log collecting stack for Kubernetes evangelists, it’s Elasticsearch, Fluentd and Kibana (EFK stack). In this example we’ll run Elasticsearch with Kibana on external node (you can use your existing ELK stack also) and will run a Fluentd inside our cluster as daemonset on each and every node, as log collecting agent. I will pass out the section about creating the VM with Elasticsearch & Kibana installations, it’s a popular enough theme, so you can find a lot of documents about how to do it better, for example you can use mine article as well. Just remove the logstesh part of config from docker-compose.yml file and also remove 127.0.0.1 from the elasticsearch ports section. After finishing you must have a working elasticsearch, that listened on VM-IP:9200 port, if you need any additional protection you can configure the login:pass or secure keys, between fluentd and elasticsearch. But I often just protecting it with iptables rules. Only things we left to do now, it’s create some fluentd daemonset in Kubernetes and specify the outside elasticsearch node:port address in configuration. This is very easy configuration, but it full enough for a quick start, it’ll collect a system and applications logs. If you’ll need something more complicated, you may read an official documentation about fluentd plugins and configs for Kubernetes. Great, now after we start getting some logs from our cluster, we can create any kind of dashboards we want. Well, of course it’s a very usual configuration so you may need to change it for your specific purposes. The main goal was to show the way how it can be done. After all previously done steps, we got a really good looking, production ready Kubernetes cluster. So it’s time to deploy some test application in it and see how it’ll be. We can take for this example my small Python/Flask Kubyk application ,that already have a Docker container so we can take it from public docker registry. Then we need to add an external database file for this app, we’ll use our configured GlusterFS storage for it. First lets create a new pvc (persistent volume claim)volume for this app, we’ll store the SQLite database with users credentials in there. We can use a previously created storage class from part 2 of this tutorial. After we have create a new PVC for our app we ready to deploy it. OK, it seems that we have successfully start our new application, if we’ll open http://192.168.0.242 IP in browser, we must see the login page of this app. We can use admin/admin credentials for login in, but if we try to login on this stage, we’ll get a error, as there is no database available yet. To fix this situation, we need to copy the SQlite DB file, from my git repository into the previously created pvc volume. So application can start using this database then. We use the pod from application and kubectl cp command to copy this file into the volume. Also we need grant a write access to this directory for nginx user, as in docker container, my application runs under nginx user by supervisord. Great, now our app is working well, and we can scale this kubyk deployment up to 3 replica for example, for putting one copy of app on one worker node. As we have created pvc volume previously, all our pods with application replicas, will use same DB, and also service will balance traffic between replicas using round robin schema. Now we got one replica of our app per one worker node, so if we’ll lose some of nodes, application will still continue working. Also we got an easy type of load balancing as I said previously. Not bad as for first time. Any new requests will be processing by next pod in list, you can check this by looking in to the pods logs. For example new user will be created by application in one pod, then next pod will respond for next request and so on. As this app use same persistent volume for storing DB even if all of the replicas will disappear, all data will be in safe. In big and complicated applications we’ll need not only dedicated volume for the DB, but also different volumes for placing static content and more else things in them. Well, it seems that we almost finished with this part of tutorial, there is a lot of things I can add, because the Kubernetes theme is big and dynamically growing, but I’ll stop for now. The main goal for this articles cycle was showing the way of creating own Kubernetes cluster and I hope this was useful enough for you. Stability and stress tests, of course. Cluster schema that we used in this example may continue working without 2 workers nodes, 1 master and 1 etcd node. You can shutdown them and see that our test app still working. When I wrote this tutorials, I have preparing same cluster for the production, in fact almost same scheme. At one day, when the cluster was created and some part of application was deployed in it, there was a big power supply issue in the DC and totally all of cluster servers was shut downed, like in scary movies for sysadmins. Some of servers was down for a long time and some got a file system errors after it. But when I started them all again, I was very surprising when Kubernetes cluster fully recovered. All GlusterFS volumes, all deployments has started. It shows a big potential for this technology as for me. Goodbye and hope to meet you again.